In the 1960s, the Western world was undergoing massive social change. 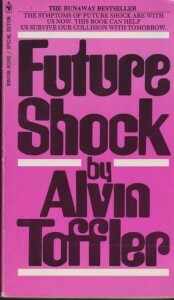 A provocative 1970 book that dared to assess what was going down then and to look ahead was Alvin Toffler’s Future Shock. Yesterday I had occasion to revisit this book, which I discovered the first time around in 1970 at university. -the pace of life, change, mobility, and increasing diverse choices would spiral out of control and that transience and a reduction in duration and permanence would become defining features of our then-future lifestyles and values. -(with the exception of hoarders) the West had or would become a ‘throw-away society’. This goes well beyond things, to include people and relationships. -marriages would become temporary and the nuclear Western family would continue to disappear. There would arise new forms of relationships and families including “homosexual daddies”, for instance–an example of the increased diversity he foresaw. -rentalism would become extremely popular for all sorts of things and services. -information would greatly increase and spiral out of control leading to information overload, decision overload, and future shock for those unable to adapt. -with the availability of replacement or additional technological parts, people would become more cyborg-like, machine-like, sensibility-wise. -because of human need for overstimulation, there would need to be more bombardment-of-the-senses types of experiences. -numerous subcults would emerge to satisfy people’s diverse needs for belonging and identity. As Toffler pointed out, we are living in an era of continuous change with an emphasis on technology and making money. It’s obvious now that the ‘losers’ in this scenario have been families, communities, public safety, health care, quality education, and public institutions and services which once exemplified the best of Western civilization. We are clearly living in a highly-technologized post-civilization era with all the obsession with money, materialism, craziness, barbarism, and violence that this term implies. As in Toffler’s day, the average Western person today can likely tell you 10 technological developments. But that person would likely be hard-pressed to list 10 ways in which their lives would change as a result. 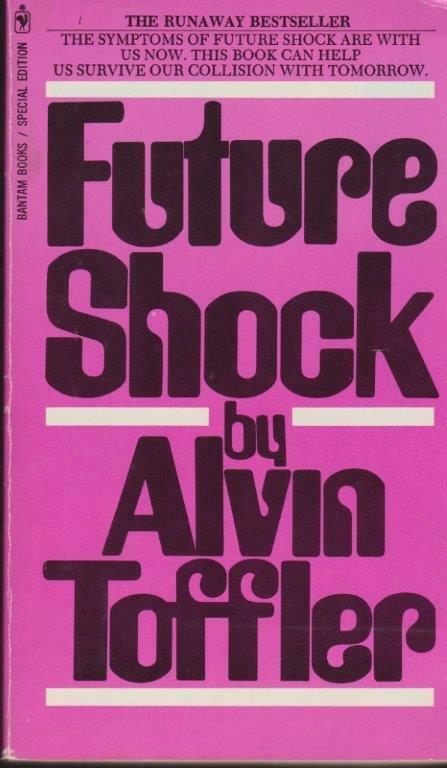 In short, the same disconnect between the same two very related important questions from 1970 would still reveal a similar naivete or ignorance about how future developments are likely to affect or change one’s own life, the lives of others, and society. The more things change….